Confession: This last post from our trip to Lebanon and Syria will be written in first person. I (Julie) have had several days of traveling time with Marilyn and Nuhad. On the curvy narrow roads from Damascus to Homs and then to Mahardeh, there has been a lot to reflect on between speed bumps, or “sleeping policeman” as Rob told us they were called in parts of Africa. Every time I have traveled on a TOF trip, Marilyn has been my leader and teacher and her words ring in my ears, but never as much as this time. These trips are not about our faithfulness, our bravery, or anything that is preceded by the word our, but they are about the church, The Church, THE CHURCH! In times of peace, in times of war, the church is here. It remains and we have come to stand with it and be embraced within it. Since the rest of our team returned home, we have been with three faithful parts of the body of Christ, the bride of Christ, his church. 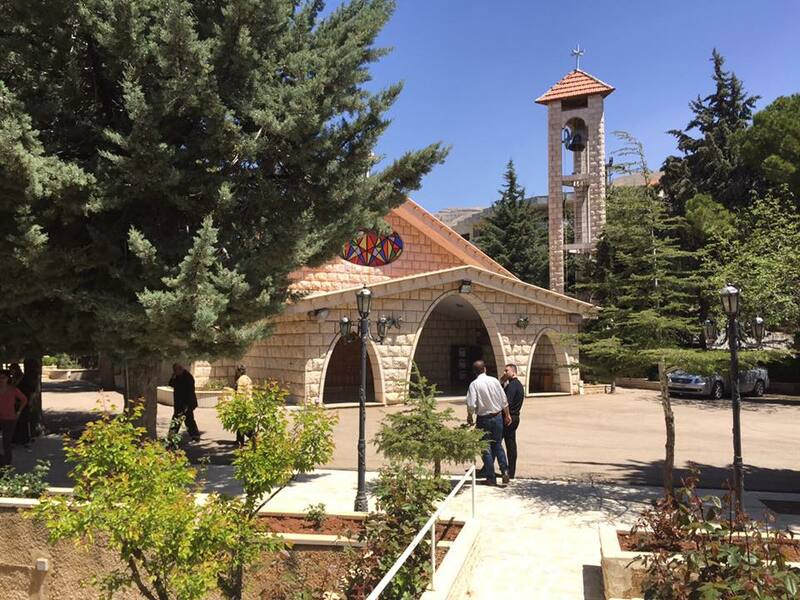 The Presbyterian church in Bloudan, Syria. 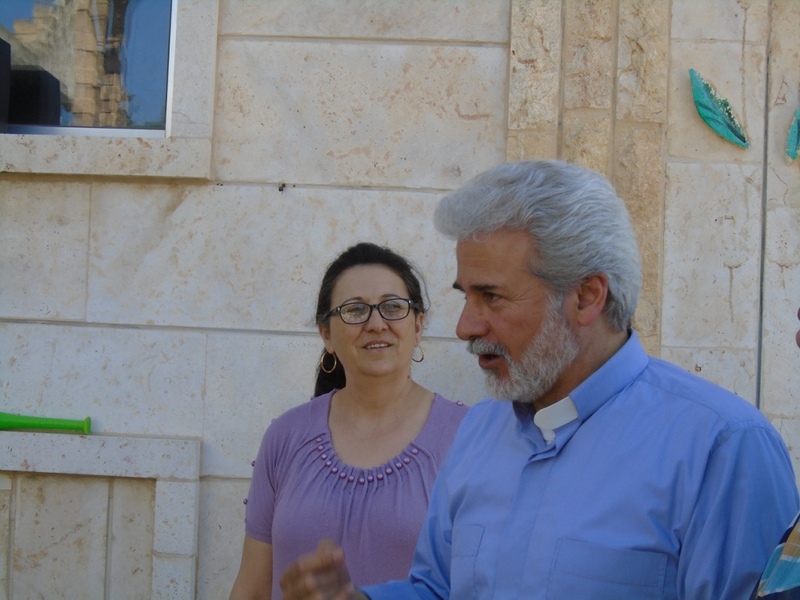 Last summer, Marilyn and I spent several days beyond the women’s conference at Dhour Choiuer to travel to Syria and visit a church she had never been to. Our visas were not granted and so we have waited an extra nine months to finally visit the Presbyterians in Bloudan. Bloudan is a village of about 5,000 permanent residents that in normal times expands to 400,000 as summer residents come up the mountain to escape the heat of the valley cities for its cool breezes, summer homes and restaurants. It is a mere 50 miles from Damascus, so the drive is short. Well, the drive was short. Now, the last nine miles up the road once you’ve turned off the main highway require ten different checkpoint stops. This little village is surrounded by five other villages, one of which is Zabadani. Last summer when we tried to get here, Zabadani was the scene of pitched battles between radicals, Hezbollah and Syrian army forces. Similar battles were fought in all five of the cities, and as we made our way slowly up the road, one of those cities was still cordoned off by razor wire as the battles still rage. The Bloudan church elders and women’s leaders on the chancel of the church. Assis Feras Ferah, who is pastoring the churches in Hasakeh, Kamishli and Malkieh in the northeast, is from this church. Many of these people are family to him. His mother is embraced by Marilyn Borst in the center. 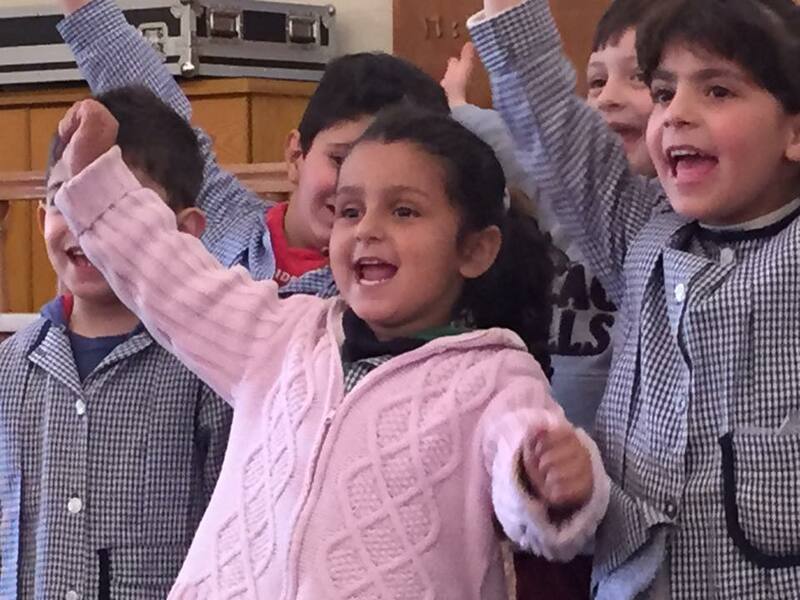 The Bloudan KG kids lead us in worship. together, we were reminded that they might not have electricity but that the light of Jesus shines brightly in and through them all. In solidarity with the other Christians here who are Greek Orthodox, they will all celebrate Easter together on the Eastern calendar day of May 1. And they were teaching the children this word in song: Jesus is risen! He is risen indeed! After a refreshing drink from the spring that flows from this mountain place, we headed back down the road, through the ten checkpoints, past the razor wire and the pancaked buildings and back to Damascus for our final night there. Saying goodbye to Assis Butros and his wife Wafaa, we headed to Homs. 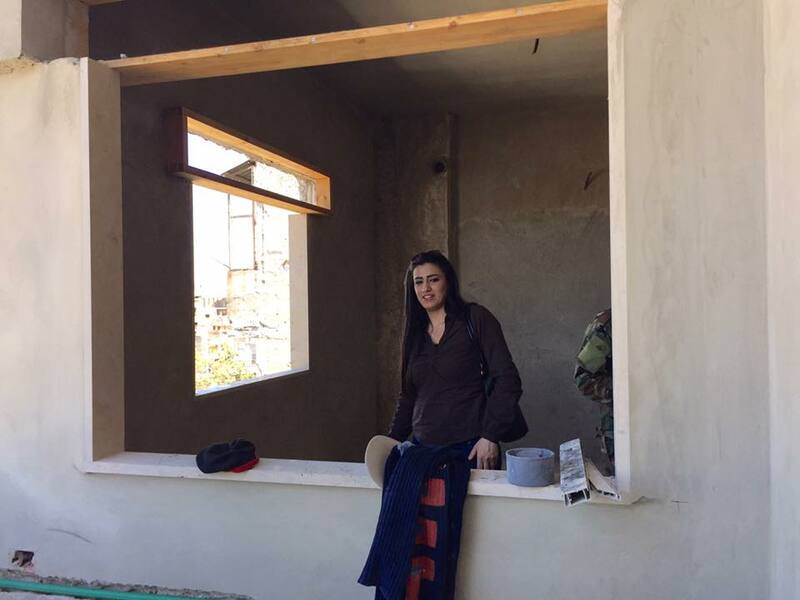 Michelline Koudmani in her Aunt Mona’s house which is currently under reconstruction. When Marilyn and I last visited Homs with a group from TOF it was November, 2014, and Homs had only been relieved of its near three-year siege for about five months. We visited seven different churches in the old city, which once was home to about 60,000 Christians. The churches, including the Presbyterian church, had all suffered destruction in different degrees. We gathered together as a group with the newly minted confirmation class under a cross-shaped hole in the roof and they sang hymns of joy for us in the promise that this church would be repaired. Now standing inside the beautifully restored church on an April day in 2016, the promise is indeed fulfilled. God is good. All the time. Elder Abdul Almessieh Salta, a civil engineer, pointed out the beautiful wood ceiling panels. Most of them are original but some are made of new materials to replace the damaged ones. The craftsmanship used on the new ones makes them indistinguishable from the original. Assis Mofid and his wife Michelline also walked us through what will be the pastor’s home once it too is repaired and refurbished. 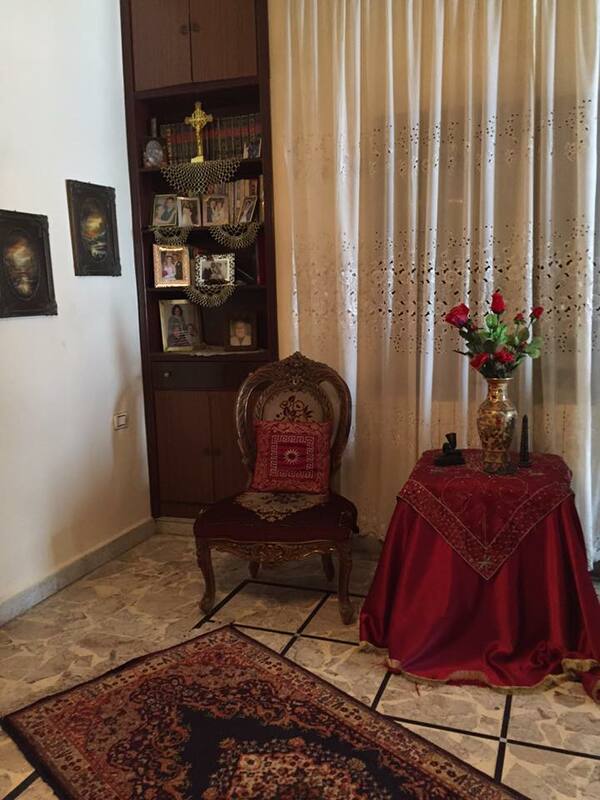 Elder Najwa’s home in Homs, now fully restored. This chair is the only one of her belongings to survive ISIS, but her home is filled with the love and light of Jesus, as she lives here with here brother and sister. Refurbished homes in Homs was our next order of business. Although there is still much destruction all around on a massive scale, people are returning to this place. We were told that about 2,000 of those 60,000 Christians have returned to the old city. Driving through the narrow streets, we saw small shops and restaurants where hopeful people wait on those few who are back. And there is reconstruction going on. The Presbyterian church identified 39 homes of church members that could and should be repaired so people could return home. With several gifts, including one from TOF, a number of those 39 have been completed or are in different stages of completion. We visited the home of Michelline’s aunt Mona where workmen were busy. Although the rear of the fourth-floor walk-up is still open to the outside, structural posts and beams have been replaced, tiles have been laid in the kitchen and bathroom, and six rooms are defined. In my mind I can see Mona back here with her husband. From there, we drove a short distance to the home of elder Najwa, who had been our constant companion on this visit in Homs. We had first met her on a video at the consultation of this home-rebuilding project in Homs. She was the first one from the church to return to her place and begin rebuilding it even before this project was put in motion. She was a teacher and a principal in a government school, and before the war lived in this apartment with a sister and two brothers. They had precious little time to leave before ISIS came storming in. These radicals had moved all of her beautiful furniture out of the sitting room and just sat on the floor. Before they left, they burned most of it and stole the rest. Now sitting here with her sister and brother (one died before he could return), it was like every other beautiful home we had been invited to on these trips. Pictures on the walls. Rugs on the floor. Reminders of life all around. And one precious original chair, which had somehow survived. We enjoyed lunch at a newly opened restaurant called Cello, owned and operated by yet another Presbyterian church member named George. It had always been his dream to have a real restaurant in Homs, more grand than his former fast-food operation, and here we sat. Ninety would be here later this evening for dinner and karaoke. Dream realized. Life renewed. Assis Ma’an Bitar and wife Gwath Hanna of Mahardeh. Ma’an also pastors the church in Hama which is nearby. From Homs we headed back to the road. Faithful Assis Nuhad drove through more unfamiliar roads on a roundabout way to Mahardeh, our final destination in Syria. Through small towns and farm fields, even where all seems peaceful, there are reminders of war. Besides the numerous checkpoints we stop for (maybe 30-40 on this part of our journey) we drive by gas stations where empty pumps stand. We know when a station has fuel because there will be a long line of cars, trucks and motorcycles waiting, sometimes as long as six hours, for maybe five gallons. Nuhad stops periodically at roadside stands. “Benzene?” he asks. As we watch the fuel gauge drop to about a quarter of a tank, his question is answered in the affirmative and a 20-liter container of gas is brought to the side of the car with a funnel and hose. A quick transaction and we return to the journey, but this is daily life here. Mahardeh. Sitting peacefully on the terrace of Assis Ma’an and his wife Gwath, I have my own dream come true. Six years have passed since I first made this journey with TOF, Marilyn and a group of faithful US Presbyterian women. Sipping a cold beverage, I take in the blooming beauty of roses, onions and parsley in the garden and a view of the church where Ma’an’s father served before him. As we speak about how the war has affected this place in Syria, the only 100% Christian town in the whole country, we hear about the 6,000 mortars and shells that have rained down since the beginning back in 2011. Claude, a young man without family here now except for this church family, obediently retrieves an unexploded shell that had implanted itself in the garden bed right next to the terrace. 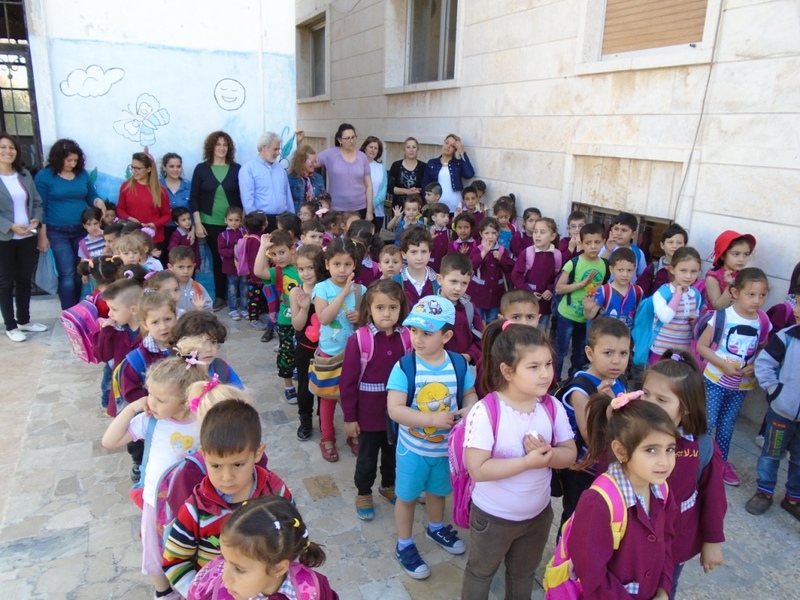 The children, teachers and staff of the Mahardeh KG. The little five-year-olds on the far right will graduate in May. A bright beautiful morning greeted us after a peaceful night’s sleep in the Bitar’s home. Breakfast of fried eggs right from the chicken, homemade zatar, dried figs, birthday cake (another story!) and coffee gave us strength for this day. If you think our energy tanks were empty, we quickly had them filled with a visit to the KG run by this church and led by Gwath. 70 precocious children had arrived in the church yard and were standing in lines organized by age groups, singing a welcome for us. Dark hair, blond hair, brown eyes, blue eyes, some in their official KG uniforms, they said in unison “Good morning! We welcome you! Thank you for everything!” This vital ministry has never stopped and its importance cannot be over emphasized. These children will be the reconcilers of this land in the future as they learn the ways of Jesus. Looking a little closer beyond the group to an individual, we look into the deep dark eyes of three-year-old Fala. Clutching her rolled up bread sandwich, taking intermittent tiny bites, her eyes never leave Marilyn’s face. We are told that her father suffers from mental illness and the church has tried to help him find a job, and to supervise his taking his medication so he can remain stable. This KG is a place of peace and solitude for this precious little girl and all the Falas like her. Finally we spend some time with about twenty men of Mahardeh who have organized themselves into a kind of national guard unit to protect this place. They have 13 separate points around the city where they take turns on patrol and duty. When shells do hit homes and buildings in Mahardeh, they immediately repair the damage because they are determined that they will remain in their homes. We walk to a place where we can look just a short distance down into the valley and see how close the front line is. All of these men are volunteers with every day normal jobs: contractor, painter, carpenter, engineer, teacher. 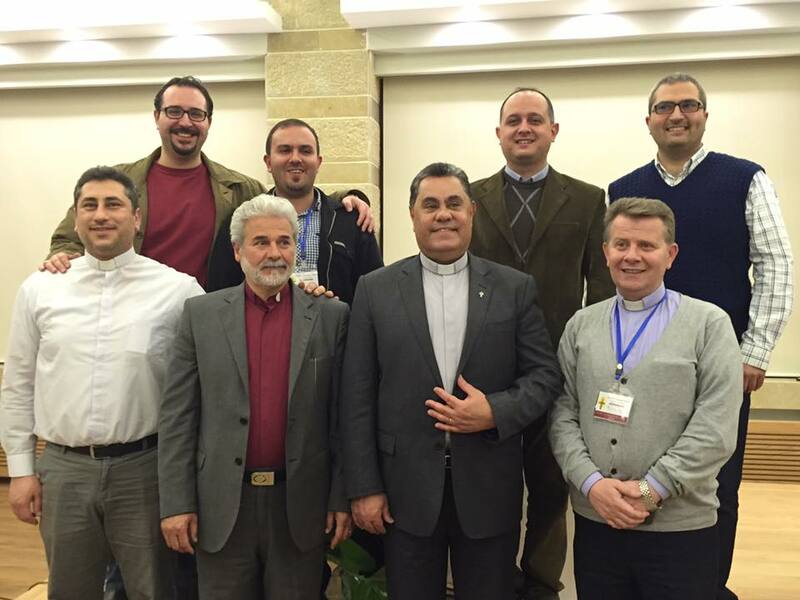 They are men of the chuches – four Greek Orthodox and one Presbyterian. They are men with families, and their families have suffered loss, but they remain constant and determined. One man named Simon who acts as the leader, invites us into his home and we are served refreshing lemonade and the always present cookies by his wife Reema. And before we leave, in solidarity as brothers and sisters in Christ, he gives us each a Russian icon of Jesus which reminds us that we are one in the Lord. This is the joy I have as I travel with The Outreach Foundation: the church, The Church, THE CHURCH! I am humbled to be a part of a global body, to be present with them in times of war and in times of peace. To mourn with them. To rejoice with them. To walk with them and to sing with them and to dance with them. I pray it for each of you who reads this: to lift them up daily and see their faces when you close your eyes to pray. They are you and you are them, and we are one together in Christ. Many of the members of the consultation in Lebanon meet with the Syrian ambassador to Lebanon in dialogue about the situation in Syria. Our last full day at the consultation of global partners was a full day that once again began with worship and reflection. Elias Jabbour of Aleppo led us through the music of a Taize service and voices were raised in English, Latin and Arabic. Najla Kassab, who not only runs this conference center but is also in charge of Christian education in NESSL, offered a meditation on 2 Cor. 5:16-21. This portion of Paul’s letter to the church in Corinth is about reconciliation and offers that since we now know Jesus, it is through those lenses that we should look as we seek to reconcile one to the other. We need to look “beyond the flesh” and get beyond those prejudices and hatreds that hinder reconciliation. It is not a process that takes three days or months. This is April 13, the 41st anniversary of the start of the civil war in Lebanon that last for fifteen years. The process of reconciliation is ongoing here, and that was the message that Najla wanted us to hear. Reconciliation is a long journey, but we must do it from a perspective that is beyond the flesh. Our speakers today had the task of reflecting biblically, theologically and personally on encounters with the other, and in the context we are in here in Lebanon/Syria, those encounters are of the interfaith variety: Christian to Muslim, Muslim to Christian. Rev. Agnete Holm of Denmark and Rev. Hadi Ghantous of Minyara, Lebanon, friends of long standing, carried us through several biblical passages – Old and New Testament – where these encounters take place. And Hadi offered this thought to us about how we read and understand the Bible. The Bible is about encounter. From the beginning God created someone to have an encounter with. Not only does it show us what we are meant to be, but what we really are…what we should NOT be! It is a mirror. The bible is not telling us to do that, but to learn from that. Agnete reminded us that interfaith dialogue is about building loving relationships, but there are always ups and downs. We fall out, disagree, hate, debate. It is not about agreeing or reaching consensus, or creating harmony. It is about maintaining relationships no matter the fallings out or the comings together. That is long-term vision, not built up in three days, but three decades, the slowest type of ministry you can engage in and the easiest to destroy. And from there we moved into an actual interfaith dialogue as Dr. Ibrahim Shamseddin, a Shi’ite Muslim, deeply religious man and friend of the Synod, came to the podium. His first words to us were that he had come with a prepared, written presentation, but as he listened to Najla’s reflection and those of Agnete and Hadi, he offered this: “We change our text when we dialogue.” He talked of the diversity of God’s creation: this is his will and should remain this way until he calls us home. If he had wanted merely clones, he would have made us this way. “Interfaith dialogue is about making relationship with others. We see ourselves in the other. Christ is a part of me as well.” And he finished with this thought, which is a good place to leave the formal part of this day: This is an earthly experiment, to live peacefully with each other. I can be with you fully without fitting into your doctrine or dogma. We do not need to clone each other. Diversity is salt, is wanted, and will remain a part of creation. Rev. 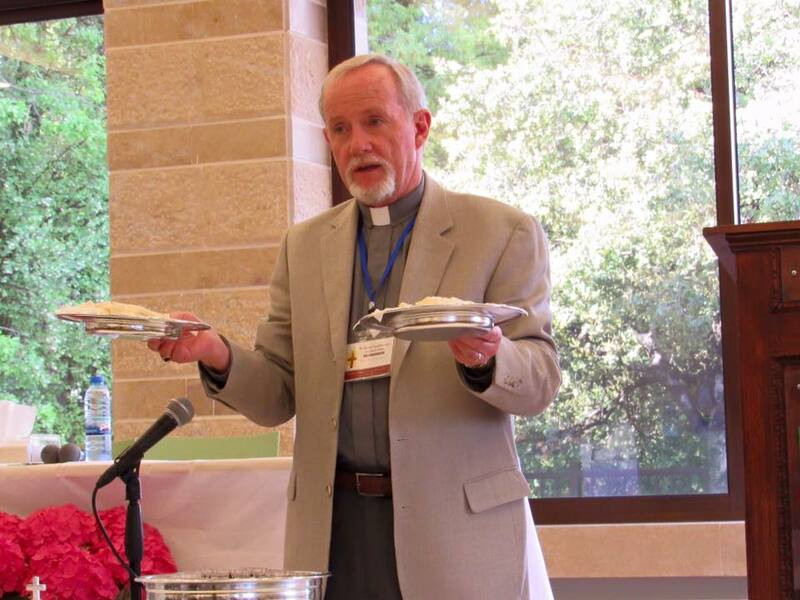 Tim McCalmont from California offers Christ’s body, broken for us all. And should you one day make the journey to this part of the world, you would be blessed to come to the end of a conference or consultation where the body of Christ is invited to his table. Lebanese, Syrian, American, Danish, French, Swedish and German followers share the peace of Christ and remember his sacrifice in broken bread and shared cup, for this is the encounter that changes us all. 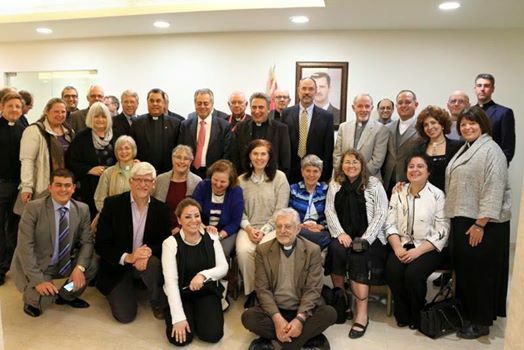 The eight Presbyterian pastors serving in Syria (back row left to right) Jacoub Sabbaagh, Fairouzeh; Mofid Karajieli, Homs; Salam Hanna, Latakia; Elias Jabour, Aleppo; (front row left to right) Firas Ferah, Hasakeh, Kamishli and Malkieh; Ma’an Bitar, Mahardeh and Hama; Butros Zaour, Damascus; and Ibrahim Nsier. Marilyn led us in worship Tuesday morning around this passage of scripture which is incarnated for us here by the serving Syrian pastors who have been among us and are the reason we came: to sit with and listen to them tell the stories of affliction, persecution and perplexity of their home places, but also the resurrection stories that come from those same places. 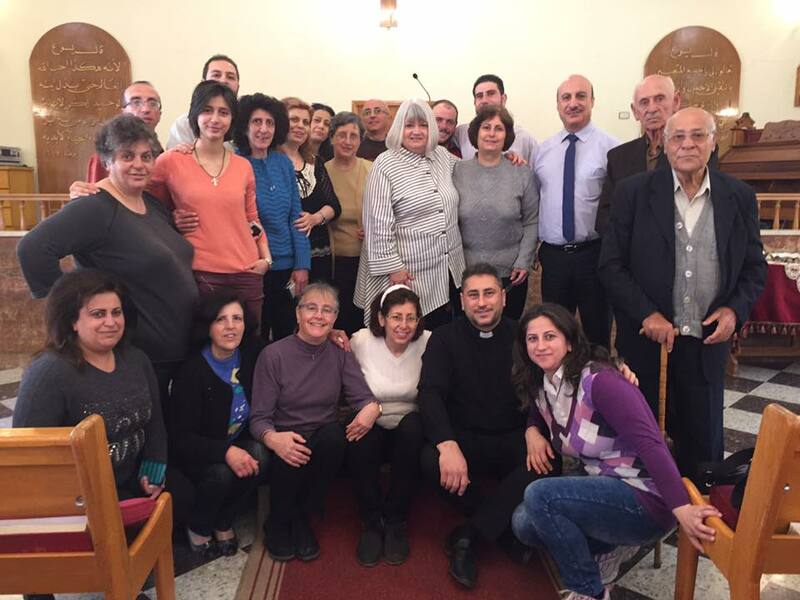 This is the church of Lebanon and Syria, and why we need each other. The global church models perseverance for us, and that is Paul’s theme. The church remains hopeful, constant. This text refers to the faithfulness of the church over the long time through difficult circumstances. Story upon story, picture upon picture, video footage that brought smiles one moment as smiling Sunday school children in the northeast of Syria showed their Christmas projects, and then sadness the next when a series of coffins was displayed, victims of a series of cruel bombings in the same city. But as we hear the sadness and overwhelming circumstances of life in this war-ravaged clay pot of a country, we experience the resurrection as well. In Homs, a city under siege for almost three years, churches are being rebuilt and homes are being repaired and families are moving back in. This is the church we have come to be with. This is the church we are a part of. This is the body of Christ and its life of faith and hope and love and endurance is the witness to the glory of God. May it ever be so. First of all, it is such a humbling privilege to be here with the church of Syria and Lebanon, learning from them about being the church in the midst of a crisis. Every moment we spend with these faithful brothers and sisters is a gift. There was a cost to come and spend these rich moments with them, but the cost they bear to travel difficult roads and cross formerly open borders is greater. So it is our joy to sit and listen to their stories of faith, even on a day that begins in the sunny morning and ends when that same sun has set for the evening. This will be long this evening, but stay with it until the end.